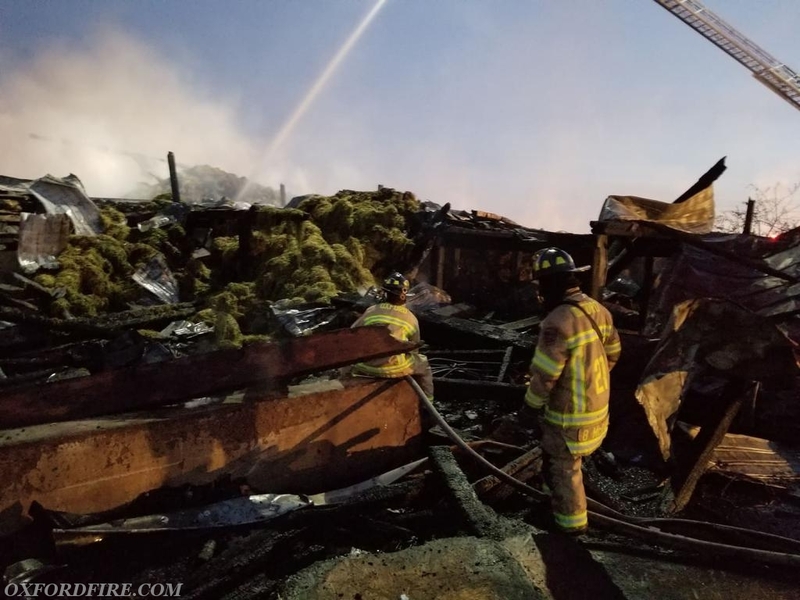 At 0255 hours, the Union Fire Company No. 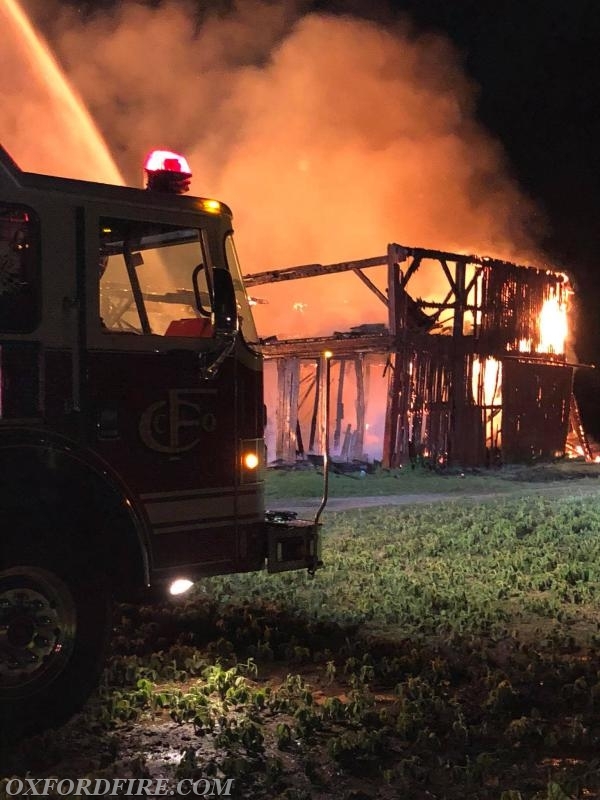 1 was alerted for an Engine to assist the Community Fire Company of Rising Sun (8) on a reported Barn on fire on Hubis Lane in the Calvert section of Cecil County, Maryland. 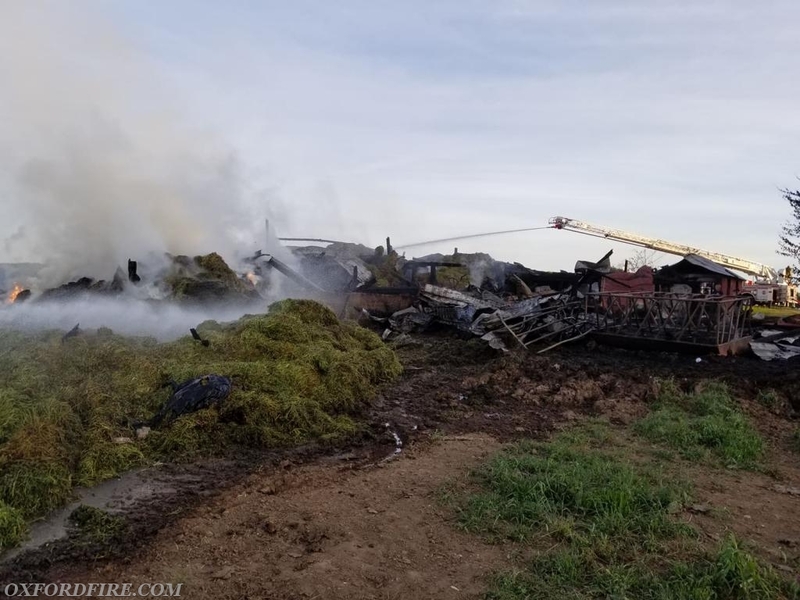 Command 8 reported a large column of smoke from the area while still responding from several miles away and requested the 1st Alarm Tanker Task Force. This request added Tanker 21 to the box. 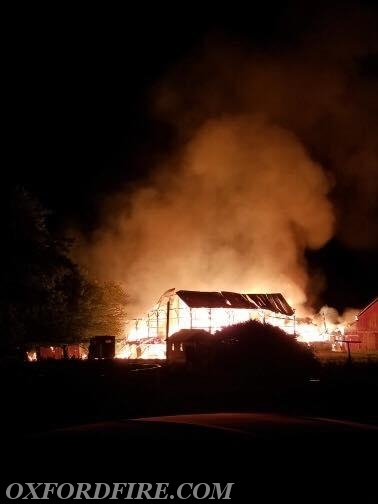 Command 8 arrived and reported a 200' x 200', 3-story barn full of hay and fully involved in fire. The 2nd Alarm Tanker Task Force was then also requested. Ambulance 21-2 was also dispatched to cover the failed EMS response. 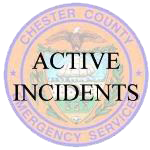 The crew from Ambulance 21-2 provided medical coverage at the scene and was thankfully not needed for any services. 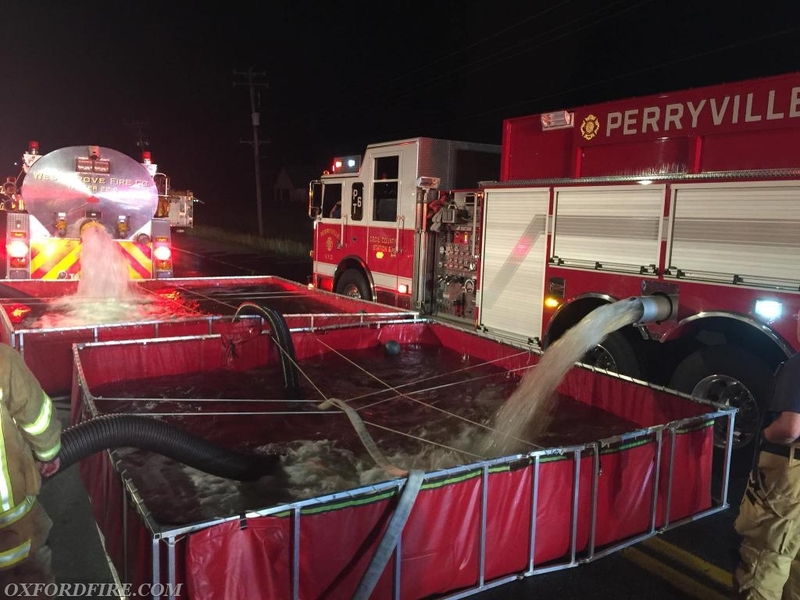 Tanker 21 (Past Chief R. Terry) arrived and was directed to drop one of the folding tanks at the scene for Water Supply Operations. 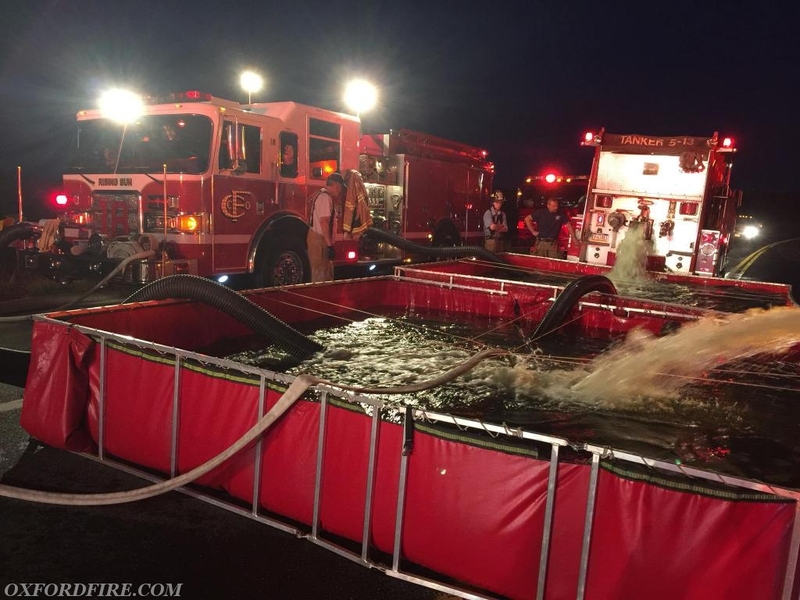 Tanker 21 then dumped it's water and entered the shuttle, hauling approximately 10 loads and 30,000 gallons of water during the incident. 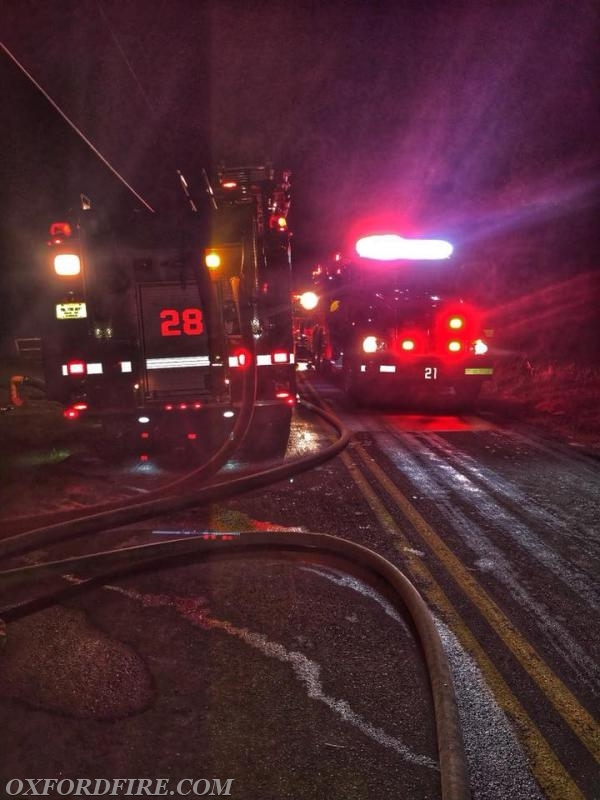 Engine 21-2 (Deputy Chief Obenchain) arrived and the crew assisted with setting up the Water Supply at Hubis Lane and Telegraph Road with Engine 18 before heading into the scene to assist with fire suppression and overhaul operations. Command then requested a 2nd Alarm for additional manpower, adding Ladder 21 to the assignment. Ladder 21 (Hoseman Thomas) arrived and the crew joined the crew from Engine 21-2 at the scene. All of the crews worked for several hours until being released by Command and then reported to Station 8 for a fully prepared breakfast. The final Oxford units were clear of the incident at 0815 hours. 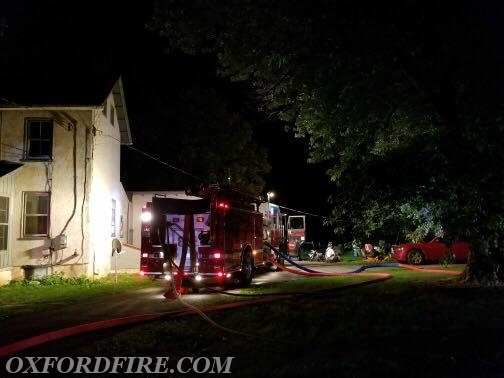 Lancaster County Engine 52-1 (Christiana), Tanker 25-1 (Longwood), and Lancaster County Ambulance 46-1 (Christiana) transferred into Station 21 to cover our First Due while our units were out. Arrival photo from the Rising Sun units. Truck 8 operates the Ladder Pipe. Engine 812 was the First Due Engine. Tanker 21 at the Fill Site on Thankless Lane. 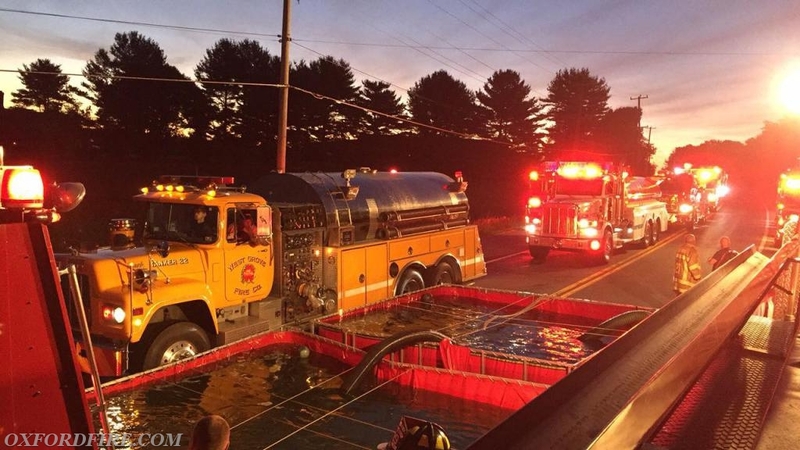 Tanker 89 dumping into the folding tanks while Engine 18 supplies the scene. Tanker 22 and Tanker 6 dumping simultaneously. Tanker 22 and Tanker 13 are the next to dump. The 21 firemen working on Side B.
Tanker 21 on it's final load of the morning.